Original 06/12/18 at 11:17 a.m.: The latest issue of Weekly Famitsu reveals new Compile Heart RPG Varnir of the Dragon Star for PlayStation 4. 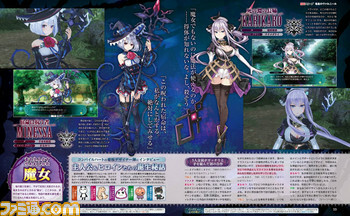 The game is being created with the concept of “witches” and “giant dragons” with five key character designers at Compile Heart. Weekly Famitsu has first information on the game’s protagonist and heroine, game systems, and more in a 12-page preview. The game’s staff includes producer Norihisa Kochiwa, director Makoto Kitano, and charcter designers Tsunako, Manamitsu, Kei Nanameda, Katsuyuki Hirano, and Riruru Meikyuu. Further information has yet to leak from the magazine. Update 06/12/18 at 11:12 p.m.: Varnir of the Dragon Star will launch for PlayStation 4 on October 11 in Japan for 7,200 yen. Every battle in Varnir of the Dragon Star takes place in the sky using magic. Players can freely move around the battlefield, which is divided into three layers, and battle against giant dragons. The witch in Varnir of the Dragon Star can devour dragons and steal their power. While this is not a Falcom game, some of the dragons from Falcom’s Trails series will appear in the game as part of a collaboration. This includes Zoro-Agruga, True Zoro-Agruga, and Ragnard. Update 06/12/18 at 11:58 p.m.: Toshiaki Takayama is designing the game’s dragons. The main theme and battle music are being composed by Motoi Sakuraba. While every battle takes place in the sky, there are also fields where you walk around. While the magazine has screenshots of battles against huge dragons, it does not have any screenshots of battles against smaller enemies.